"/all targets_verified. /all targets_confirmed. EXECUTE." There's a heightened awareness surrounding surveillance--courtesy of Snowden--that has defined a new zeitgeist for the world. 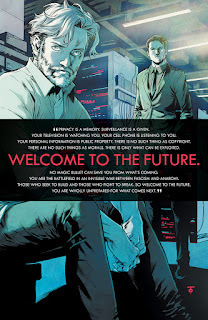 It's one where surveillance is viewed as a gift and a curse and offers little comforts when it comes to protecting one's identity and privacy. 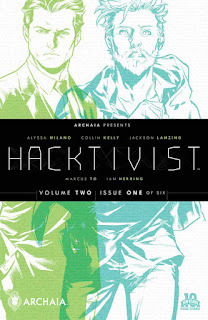 Tapping into that zeitgeist is Hacktivist Vol. 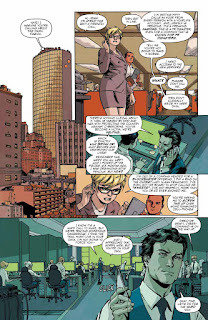 2 #1 from Archaia, created by Alyssa Milano, written by Collin Kelly and Jackson Lanzing, illustrated by Marcus To, colored by Ian Herring (with Becka Kenzie) and lettered by Deron Bennett. It’s been six months since Tunis. Nate Graft’s life was turned upside-down after his best friend Ed Hiccox died, but he’s since pulled things together and is now in charge of VIGIL, the front line of America’s ongoing cyber operations. Just when things are starting to gain some semblance of control, YourLife, the government and Nate come under attack by a new breed of hacker…who call themselves .sve_urs3lf. Using Nate and Ed’s former handle, they want to know the truth of what happened in Tunis, and they’re calling for blood. Nate’s blood. Continuing with the themes of the first volume, Hacktivist Vol. 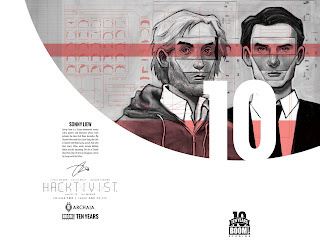 2 #1 plumbs the depths of hacking even further than the first volume. While that volume focused more on the effects hacking has on politics, Kelly and Lanzing use volume two to delve more deeply into the more nefarious side of things. The first issue runs full-circle in a pretty clean way, presenting the reader with a vague opening that is answered by a resounding finish. It's clear that Kelly and Lanzing at least brushed up on the terms that accompany this world, as the dialogue reads pretty well-informed (save for a particularly corny cloud joke). And groups like Anonymous are used as a spectre of fear, providing the reader with something based in reality for them to gravitate towards. The first few pages of Hacktivist Vol. 2 #1 are pretty busy, as To intertwines hacking threats on devices with daily routines. It's a particularly powerful way to open, as it reinforces the notion that .sve_urs3lf means serious business and offers a visual representation of the disruption hacking causes. To packs his characters with plenty of emotion, as evidenced by the characters' body language and facial expressions. 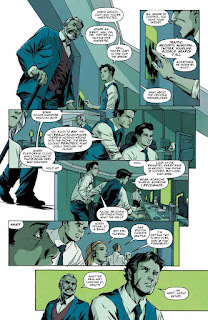 There's an unfinished quality to the work that makes it feel fairly gritty and the style is a pretty solid match for the plot, with many of the pages and panels presented in a way where the panels feel like computer monitors stacked beside one another. 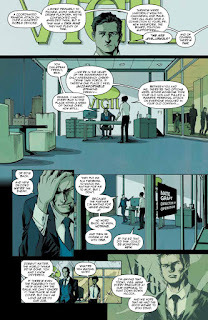 And the colors by Herring and Kenzie are washed out for much of the book, simulating the glow emitted by a computer as it works tirelessly through the night. 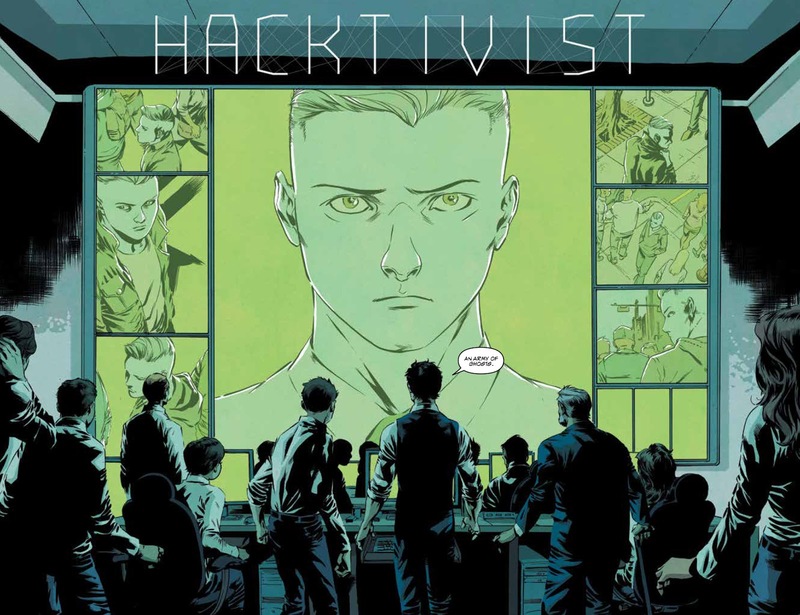 Hacktivist Vol. 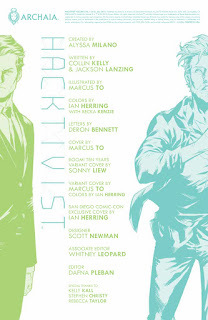 2 #1 keeps up the momentum from the first issue, moving the stakes from political rebellion to personal vendettas. Nate and Ed are going up against an opponent that even they feel is extreme, which will likely prompt responses that range from measured to erratic at best. Kelly and Lanzing infuse the book with as much vocabulary and context as possible to reinforce the notion that whatever group the main characters are up against will be a force to be reckoned with. To's illustrations are a perfect fit for the content of the book, successfully reflecting the connection devices have to daily lives. Hacktivist Vol. 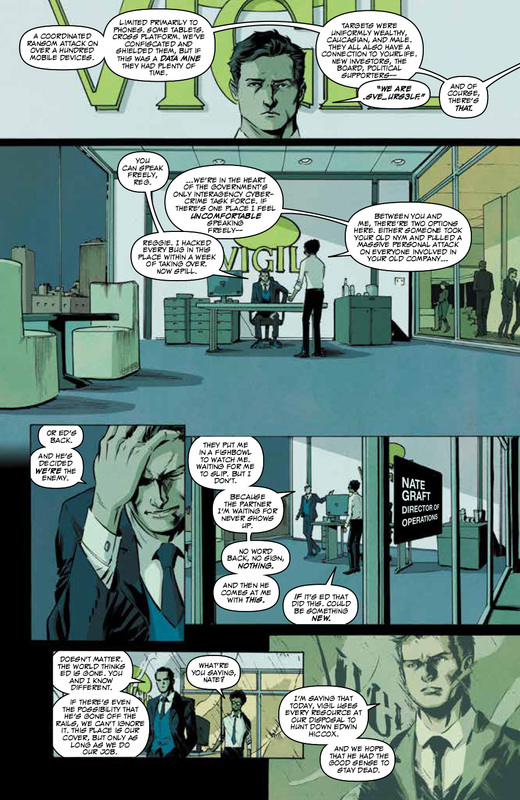 2 #1 is a strong first issue as the start of a new miniseries that hits the ground running. Hacktivist Vol. 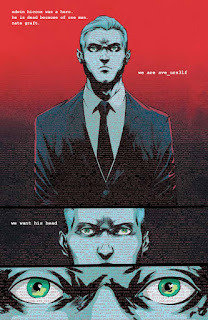 2 #1 is in stores now.